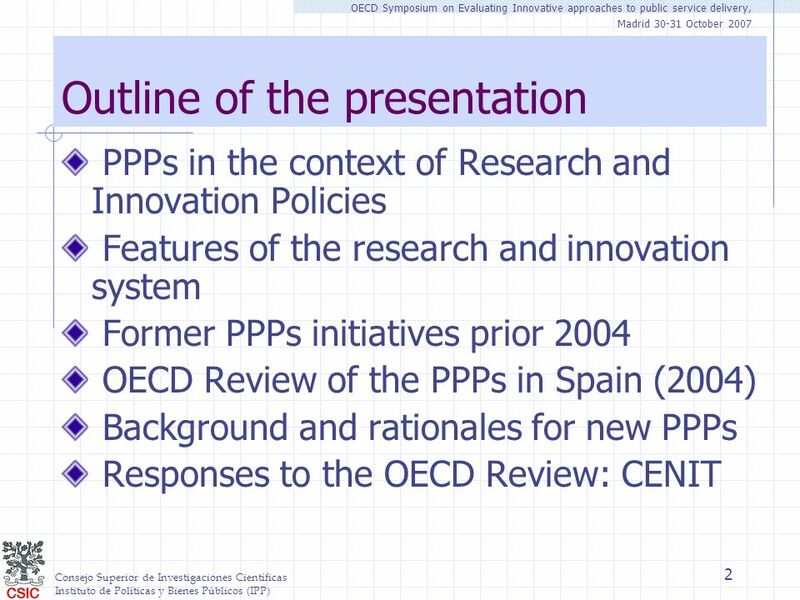 Consejo Superior de Investigaciones Científicas Instituto de Políticas y Bienes Públicos (IPP) 1 The emerging role of Public-private partnerships in Spanish. 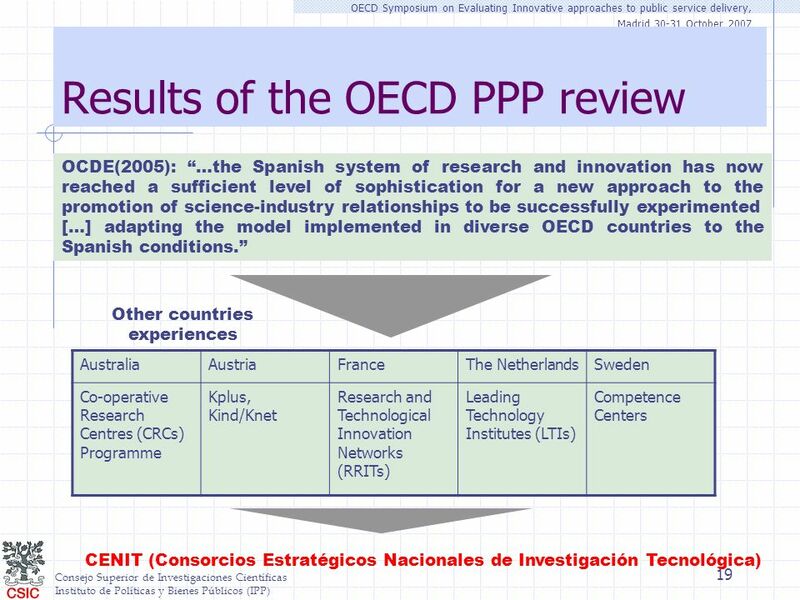 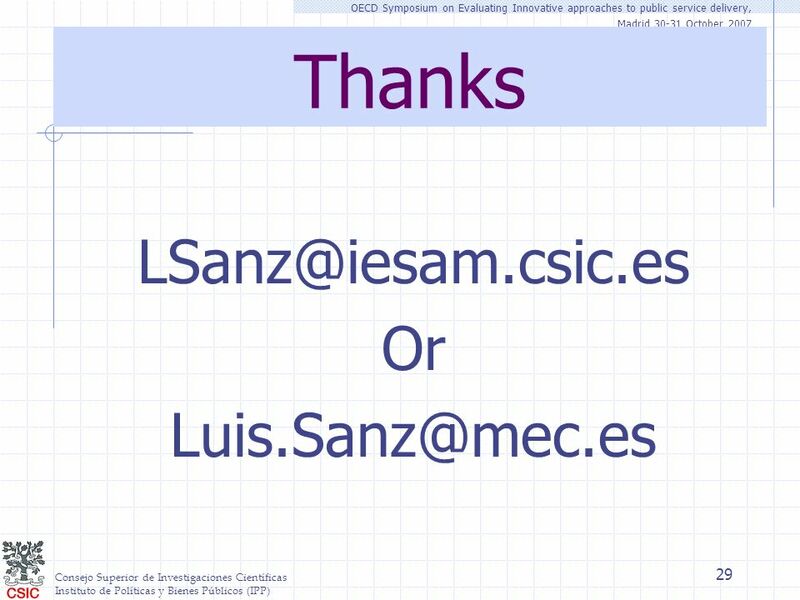 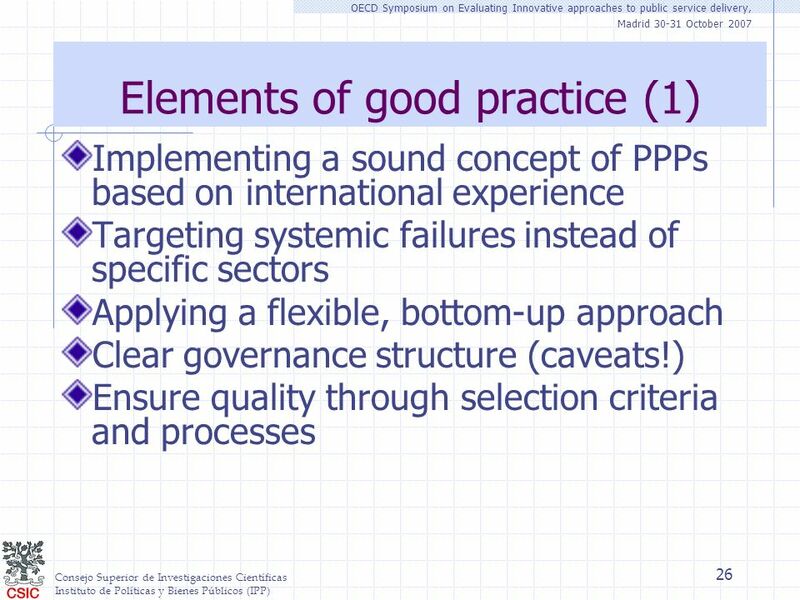 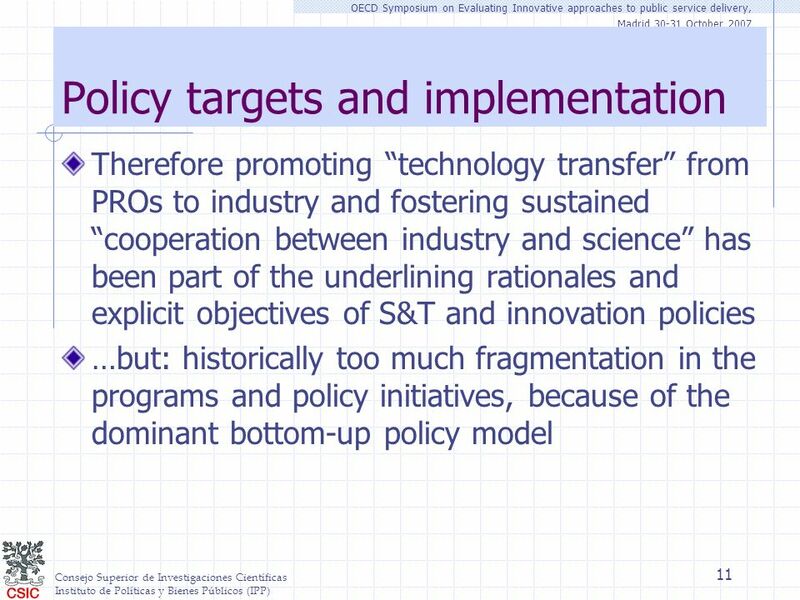 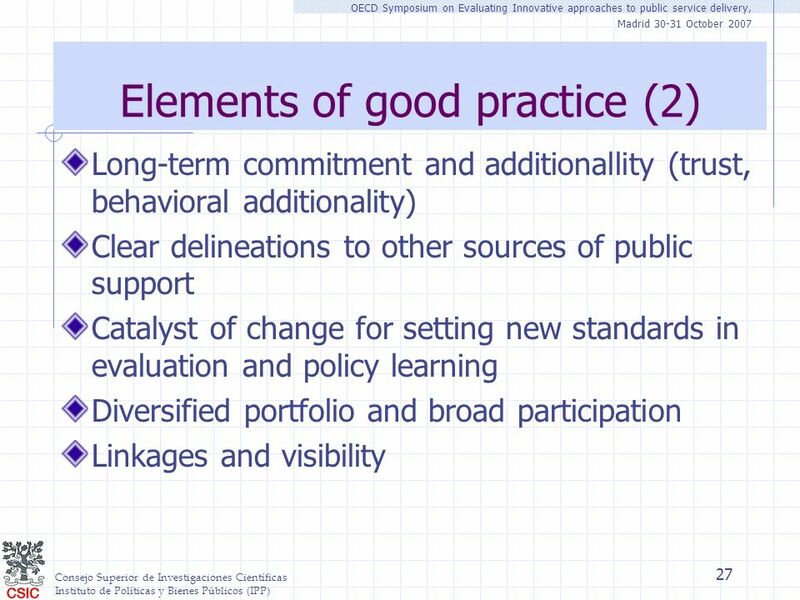 15 Consejo Superior de Investigaciones Científicas Instituto de Políticas y Bienes Públicos (IPP) OECD Symposium on Evaluating Innovative approaches to public service delivery, Madrid 30-31 October 2007 15 Problems and opportunities in 2004 (I) A new, or an evolved, policy rationale is driving the innovation system into more PPPs (new conditions for a more intelligent public funding) New initiatives from below (firms and PROs) and experiments that implies a societal demand of PPPs approaches are emerging Political opportunity: 25% of R&D budget increase expected next 4 years. 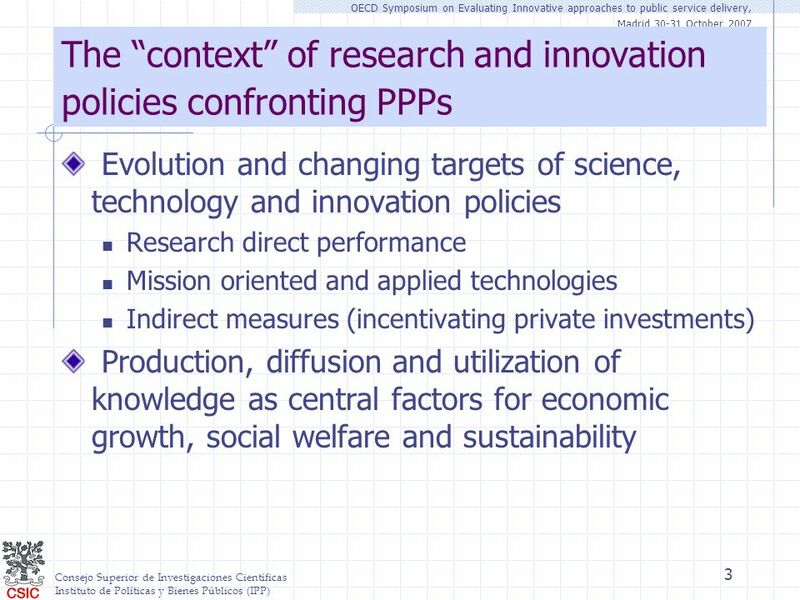 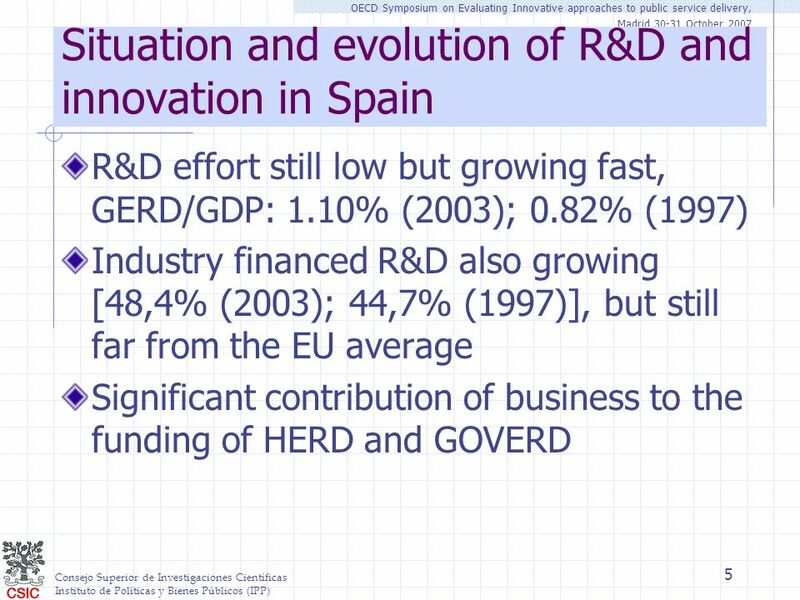 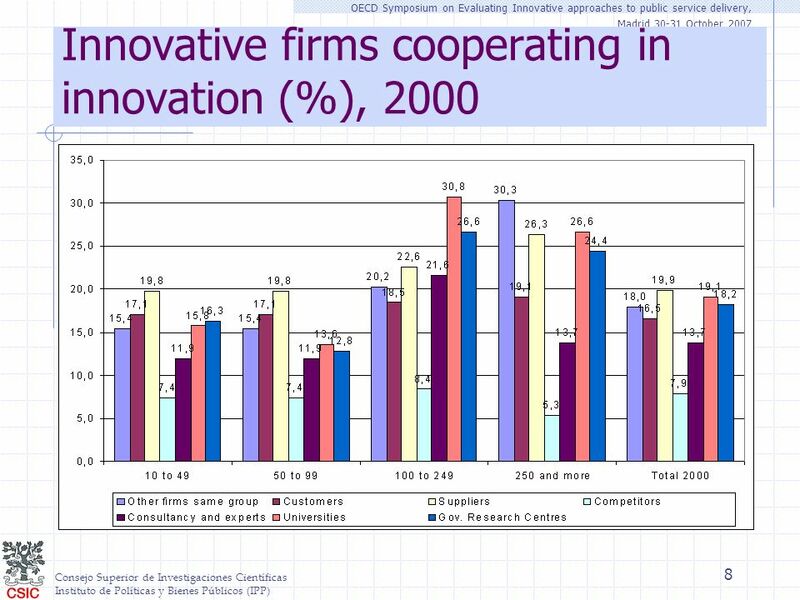 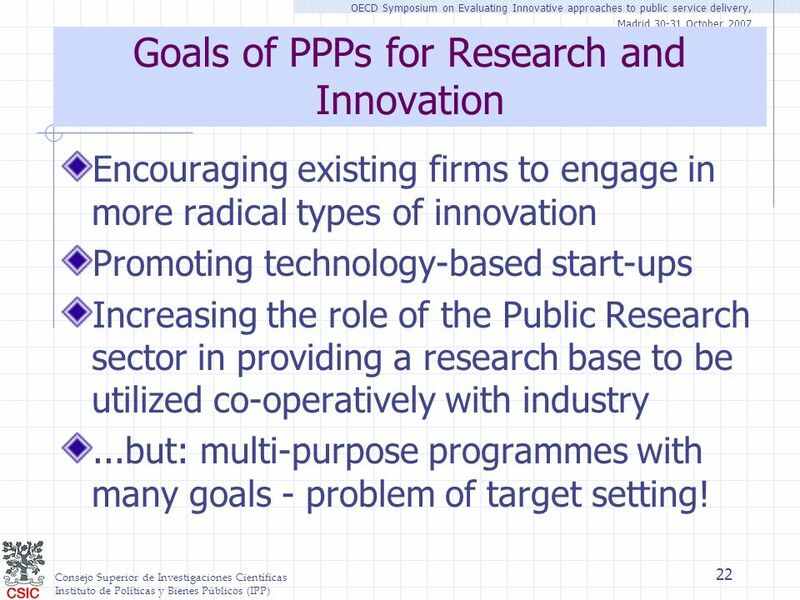 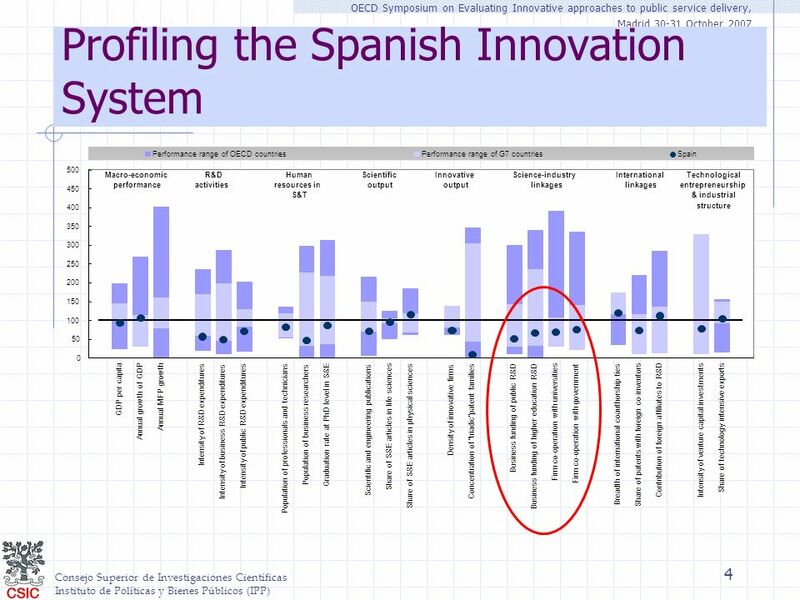 22 Consejo Superior de Investigaciones Científicas Instituto de Políticas y Bienes Públicos (IPP) OECD Symposium on Evaluating Innovative approaches to public service delivery, Madrid 30-31 October 2007 22 Goals of PPPs for Research and Innovation Encouraging existing firms to engage in more radical types of innovation Promoting technology-based start-ups Increasing the role of the Public Research sector in providing a research base to be utilized co-operatively with industry...but: multi-purpose programmes with many goals - problem of target setting! 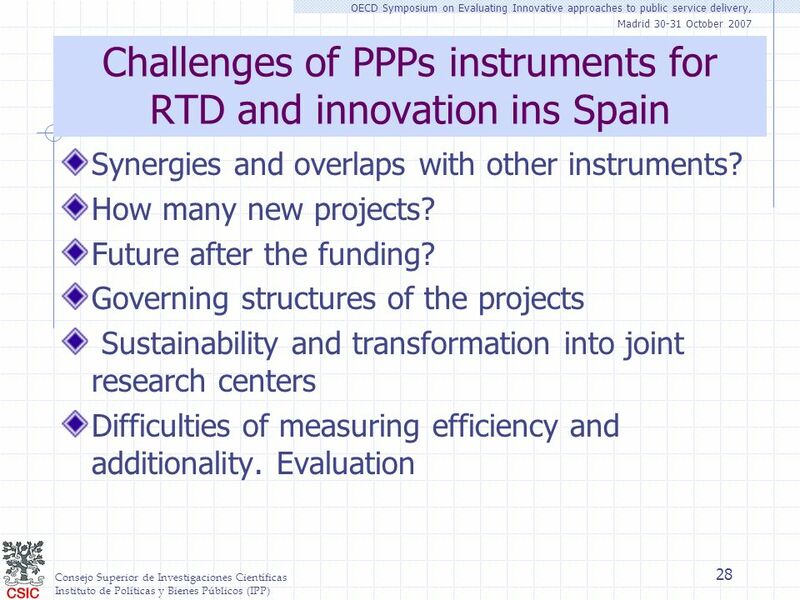 Download ppt "Consejo Superior de Investigaciones Científicas Instituto de Políticas y Bienes Públicos (IPP) 1 The emerging role of Public-private partnerships in Spanish." 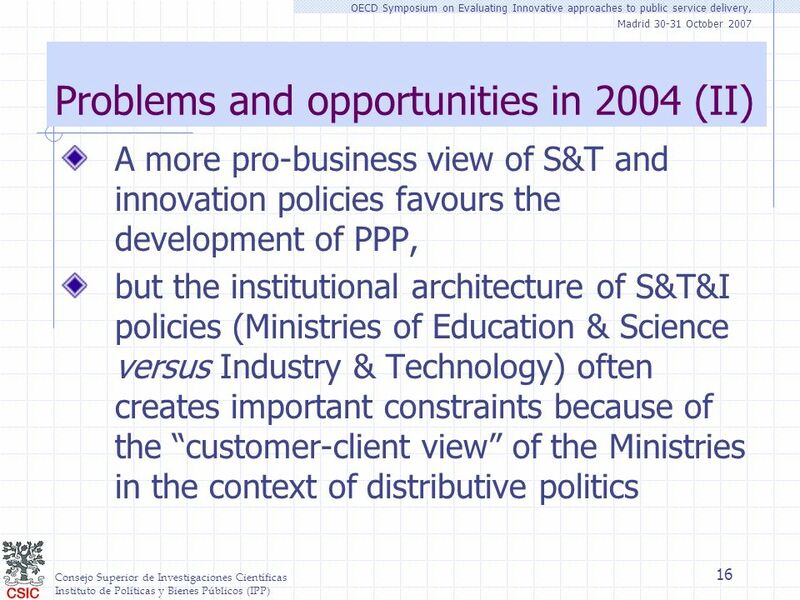 The future landscape of Research and Technology Organisations in Europe Results of an exploratory exercise Matthias Weber, 21 April 2005. 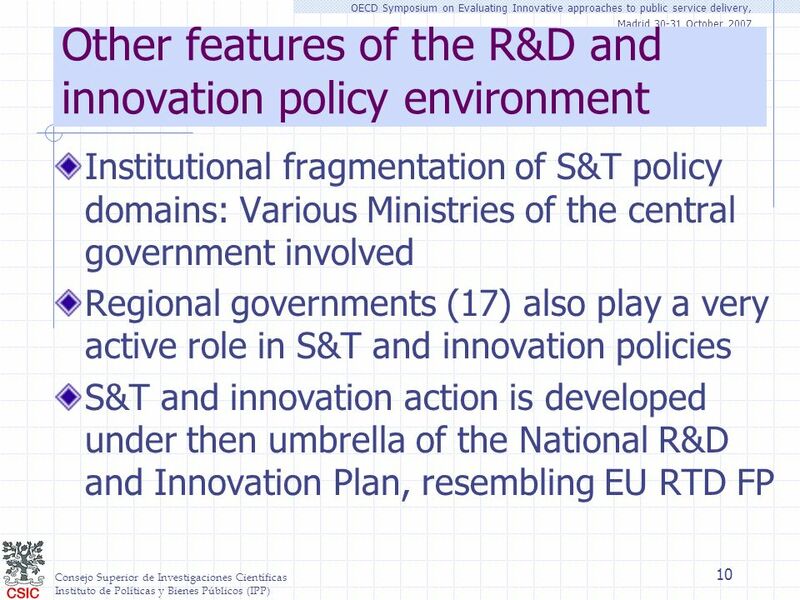 Ministry of Economy of the Slovak Republic and supporting of innovation development in enterprises 24th June 2013. 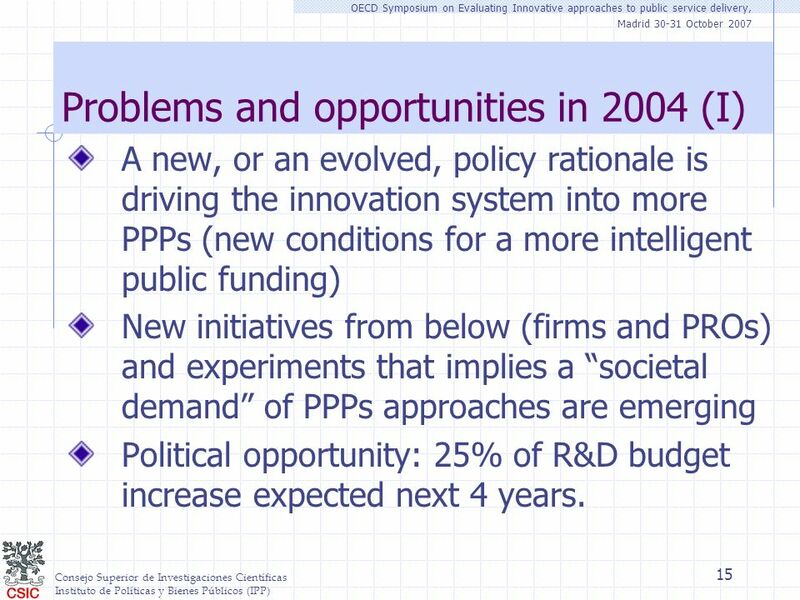 © EIPA – Robin Smail / Capacity-building 1 Brussels, 11 October 2006 Capacity-building for managing Structural Funds Robin Smail Senior Lecturer. 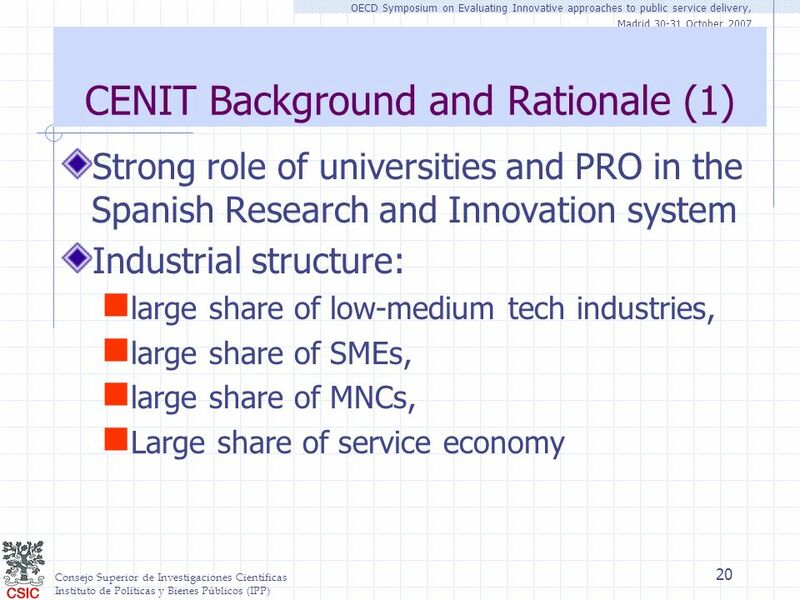 Date: in 12 pts Participation through Marie Sklodovska-Curie Actions: how to raise SME potential through EU researcher mobility Education and Culture Carmela. 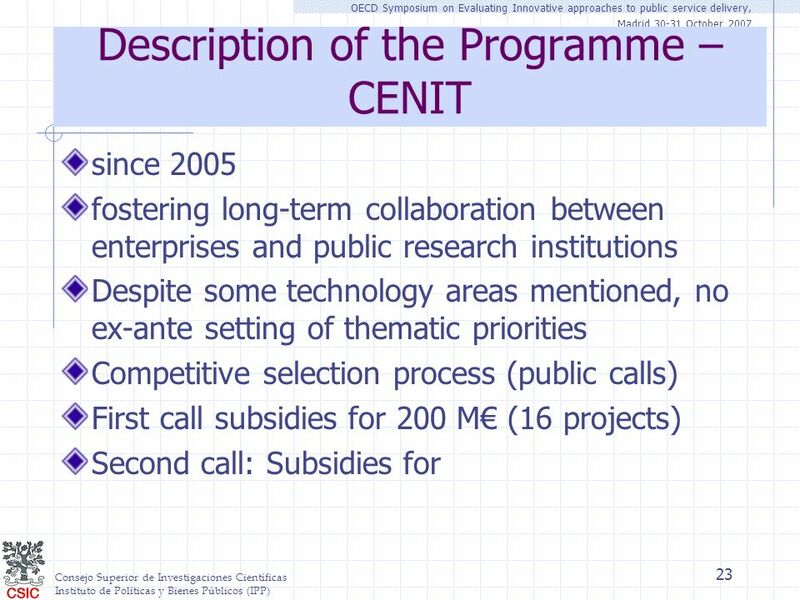 1 Effective Support for Enlargement Accelerating public investments Western Balkans Investment Framework Brussels, 19 October 2009 Alessandro Carano, EIB. 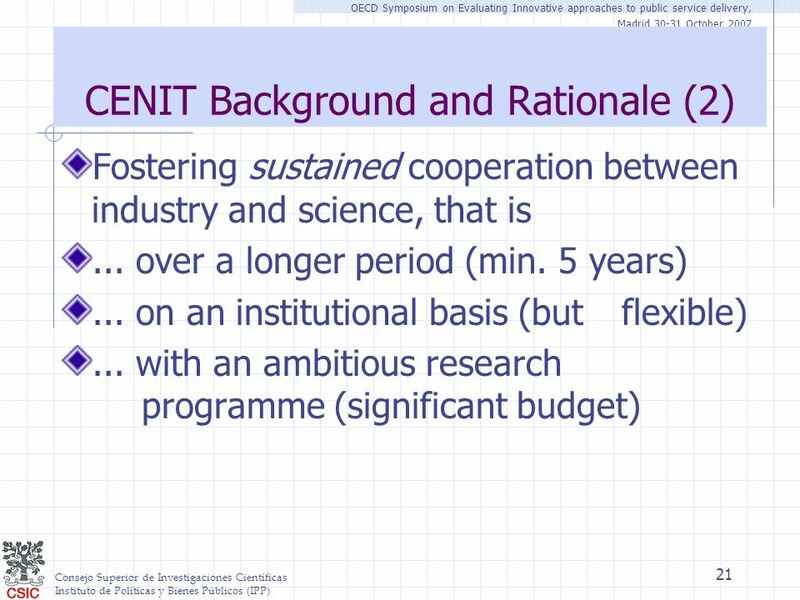 1 Establishing partnerships and maximising synergies Promoting knowledge transfer: networks and exchanges Example: Innovation Assistant Irma Priedl Amt. 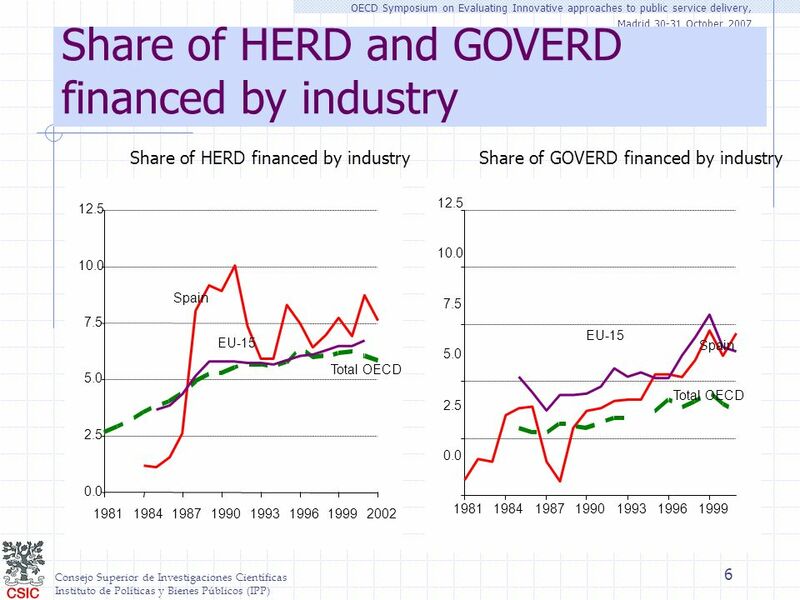 European Commission - Directorate General for Agriculture and Rural Development 1 1 1 1 EU rural development policy 2007-2013 Axis 1 DG AGRI, October 2005.